"Major trend lines" being broken to the downside; physical metals' buying (in the U.S. off significantly so far on the year; (some) long-term silver holders giving up the ghost and selling their metal below spot. About the only thing we have yet to see – on a large scale – is "paper metal" being offered at a price well below what a customer would actually pay for the physical. In late 2008, while silver was being quoted in the markets at $9.50/ounce, you simply could not find it in "real life" for much less than $12 the ounce. How Might George Soros Approach This Situation? In a recent interview for The New York Times Magazine, George Soros talked about his years' running the very successful Quantum Fund – which yielded investors an almost unheard of 40% annual rate of return. He spoke of his "theory of reflexivity" – the idea that "peoples' biases and perceptions can move prices in directions that don't accord with the underlying reality." He would "nibble" on an idea until investors' emotions became increasingly disconnected from what was really taking place – or what was almost certainly slated to be – once more balanced circumstances had come to pass. Then he would substantially add to his position. Soros didn't always get it right, but when he did, he made a killing. His most famous bet was shorting the British pound... against the Bank of England. Soros claimed his strength as an investor was in recognizing and acting on what he referred to as “far from equilibrium” moments. Shanghai International Gold Exchange silver volume continues to rise sharply. The monthly chart provides reason for cautious optimism, implying as it does that Comex futures could be bottoming slightly above $15. If a powerful and sustained upturn lies in the offing, the September contract would need to hold above 15.093, a midpoint ‘Hidden Pivot’ support... The chart further suggests that Silver must push above a peak at 21.525 recorded in July 2014 to launch a sustainable move that would have the potential to reach 55.055. Silver rests within a massive (bullish) multi-year technical descending triangle formed after the 2011 top. The Gold-Silver Ratio, currently in the area of 80:1, has portended a bull run three times since 2003. The Silver-to-S&P Ratio is resting on its trend line running from 2009.
Commodities as a group are trading at some of the lowest levels in the last 50 years. Silver – as an industrial and an investment metal – is bundled within that group. China, which doesn't export silver production, shows no signs of slowing down its silver imports. At current rates, India will import one-third of all the silver mined globally in 2018. Annual silver production is running around 850,000 ounces. The COMEX has an open interest of more than 200,000 – 5,000 ounce futures' contracts. 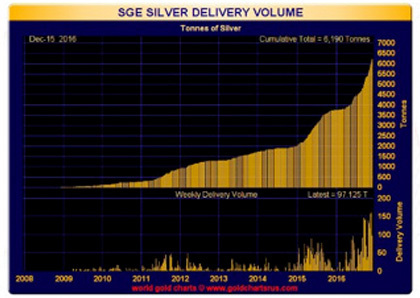 So on a daily basis, with a 100,000+ contract volume, the paper-pushing "CRIMEX" as it is less fondly known by dedicated silver stackers, trades by volume, 60% of annual global silver production. So – are you as a physical silver holder (or one who anticipates becoming one) going to run with the crowd when they are "moving prices in directions that don't accord with the underlying reality"? Will you cower in the corner or "give up" your metal at fire sale prices? Or will or you take a page from George Soros' book and act, now that the price of silver gives significant evidence of having reached a "far from equilibrium" moment? Something's got to give. Try not to make it you.